Customers lined up at the store even before the 10 a.m. opening hour on Saturday, Aug. 4, and business was brisk throughout the day, executive director Roseleen Rick said. Many customers expressed delight at the offerings and low prices for appliances, ceiling fans, lighting, furniture and building materials. All the stock was priced to sell and all of it was generously donated by both individuals and business entities. The store, located in the former Company 2 Firestation, is at 1922 Urbine Road. Habitat for Humanity rents the space from the County of Powhatan and has spent the last few months completing massive renovations to the building to make it serviceable. Many donors helped with the renovation, and volunteers did much of the work. The building now houses the store, the Habitat for Humanity Powhatan office, storage areas, and a conference room. The Habitat Store will be open from 10 a.m. to 4 p.m. on the first and third Saturdays of each month, except when the Saturday falls on a major holiday. The store will not be open Labor Day weekend to give volunteers time to spend with their families and neighbors. The plan is to expand the hours as Habitat is able to identify more volunteers to work in the store, Rick said. On its first day of business, the store saw about 50 customers come through the door and made a good profit for Habitat’s critical repair fund, Rick said. “It was wonderful to see the work and the donations of so many people finally come to fruition, and Habitat is grateful to the County of Powhatan for renting the space to us. 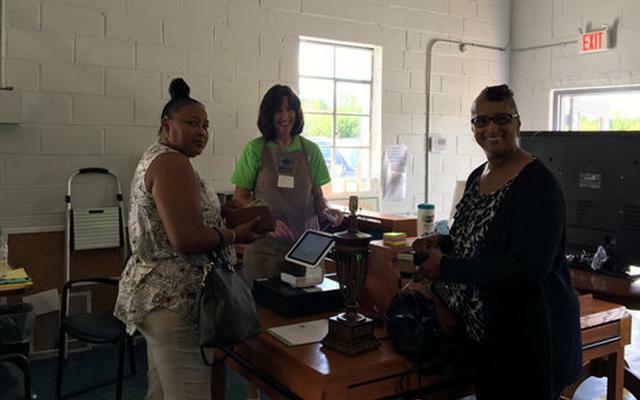 We had customers lined up before our opening time of 10 a.m., and we were delighted to have our cash register and sale items ready thanks to the volunteers, Barbara Brown and Michelle Odden, who had been working on this for months,” she said. The store will be a boon to Powhatan by helping builders donate materials they don’t need, earning them a tax deduction for donated items, and customers who need building supplies, appliances, furniture and other items at a low cost, Rick said. A huge part of keeping the store going will be getting donations in from the community and businesses that can then be sold. Funds raised from the sale of items donated will be used to support the Habitat mission of building affordable homes and making critical repairs for Powhatan homeowners, Rick said. The following items are accepted for sale: working gas and electric appliances that are less than 10 years old and clean; wooden furniture; building supplies such as new windows, door, insulation, hardware; kitchen and bathroom cabinets; complete light fixtures; electrical supplies such as switch plates, sockets, dimmers, etc. ; ceiling fans that are less than five years old; lighting fixtures in working order; plumbing supplies such as faucets, sinks, white toilets; tools; and unopened paint cans or spray paint. Habitat is not a certified cleaning facility and cannot accept upholstered furniture, any fabric, or mattresses. Nor does it accept: broken appliances or appliances more than 10 years old; clothing; mini-blinds; storm or single pane windows; bathtubs or Jacuzzis; shower walls or doors; unframed mirrors or glass; televisions more than five years old; barbecue grills, and electronic home entertainment systems/equipment or cabinets. Habitat is in need of a team that can take things apart, like plumbing and electrical fixtures. Prospective volunteers can call the Habitat Volunteer Hotline 804-372-9755. Habitat also needs some major donations such as a small enclosed van or trailer. For those wishing to donate suitable items, contact Barbara Brown at bbrown4950@gmail.com. Laura McFarland may be reached at Lmcfarland@powhatantoday.com.